: Father: M. K. Gopalaswamy, Businessman. Mother: Dr. Uma Goplaswamy, Ph.D. in Carnatic Music and classical singer of repute, Brother: Arjun, a wild life scientist. Comely, zestfully enthusiastic and convivial. That's Lakshmi Gopalaswamy, the hazel-brown eyed tri-lingual actor and danseuse, who's acted in Malayalam, Tamil and Kannada movies. The acceptance in Malayalam cinema that Lakshmi has received from the audience has made her feel much obliged to Malayalam filmgoers. Her success here has also got her offers from her home ground, Kannada film industry too. Her debut Malayalam film 'Arayannangalude Veedu' got her the Kerala State Award for the best supporting actress. Her second film 'Kochu Kochu Santhosangal' too brought in much acclaim for her acting talents. Acting afforded her a different kind of exposure. "Initially I was intimidated by the profession, I was too shy to be famous," but soon felt at home. She is very conscious about the message she conveys through her roles. "I feel a strong social responsibility as an actress. Working on her first film, Arayanangalude Veedu, with Mammootty for which she won the Kerala State Award "was a treasured experience. He has such reverence for the profession. So also the character artistes". Cast opposite many a Malayalam screen icon in different films, she has catapulted to fame in ‘God’s Own Country’. She says, though dance would always remain her fave métier, she loves essaying good roles in films. She reveals, like doing films that integrates semi-classical dance tracks, like Kochu Kochu Santhoshangal, in which two of my classical dance numbers had become catchy tunes all over Kerala. Her star status in film firmament notwithstanding, she dreams of metamorphosing into a top-notch dancer. 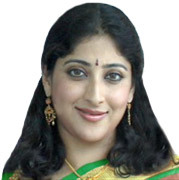 Lakshmi Gopalaswamy is a serious student of Bharathanatyam and a dancer of repute. She has been performing since the age of 12 experiencing the inherent satisfaction that takes her through the fascinating journey that art unfolds to every devoted seeker. Endowed with classical features, she has grace and a naturalness that complements her attractive personality, beautiful face and expressive eyes to this art form. A quintessential Bangalore girl, with a Master’s Degree in Women’s studies, Lakshmi chirps when quizzed on what tops the list while prioritizing her passions as "Unequivocally dance! Lakshmi is of the opinion that dance has taught her to discipline herself. She feels that since dance and films are allied arts, it influences each other tremendously. Her dancing prowess is vindicated from the fact that she is the first one from Karnataka to have bagged the prestigious Madras Music Academy’s MGR award for Best Young Dancer. Incidentally, her mother, Dr. Uma Gopalaswamy, a PhD holder in Carnatic music, lends her voice for her dance shows. She acknowledges two people with an edifying influence, who were instrumental in making her love for dance, escalate to great heights. One being, Guru Narmada. Says Lakshmi, Her tacit support and unmitigated encouragement always served as an impetus to perform better. She always fuelled me with confidence, imbued me with plenty of verve, thus buttressing my spirits all the time. The second person, Lakshmi says, is Prof. M.R. Krishnamurthy of Kalakshithi who brought about the overall flair, fluidity and finesse in her footwork and body movements. Says Lakshmi, A good dancer should know how to translate the aurally-soothing music (by accompaniment artistes) into visually-stunning dance movements. She should be able to pique the audiences’ deepest feelings by striking a bond between them, and not merely entertain. Sensitizing them to aesthetics and nuances of your dance is equally vital. Finally, you should enjoy being yourself, by ripping off all the faux veneers. Lakshmi calls herself an ‘instinctive dancer’, and says, it’s fun to thrive on improvisation, and to rise above technical parameters of dance. She reveals, I don’t like being ‘prepared to a T’ during my dance shows. Though I chalk out the framework within which to operate, yet, some part is presented by me ‘off the cuff’. This really proffers high fillip to your creative competence. Besides dance and acting, she models too. To Lakshmi, modeling is not a full­time profession but a fleeting fascination. Her beautiful eyes speak, "I see modeling as a break from dance. It's a lot of good fun. You get to travel, meet a host of interesting people and build your con­tacts. Besides there is the inherent freedom of earning. I must admit that I am a lit­tle selective about the offers I accept. I may fall into another slot of models altogether. My choice limits me to 'house bound' roles because I wouldn't want to endorse a product that requires me to be what I am not. For that matter, I would­n't want to be playing second-fiddle or look like a set-prop either. Often, my moral standards also play on my discre­tion. For instance, I wouldn't want to do an ad that glorifies fairness as a syn­onym for beauty. I am also averse to doing liquor ads." Deadlines depress her, being lazy is something actress Lakshmi Gopalaswamy loves. She delights in dressing up, loathes sending e-mails and is not a morning person by self confession; she hated exams and unabashedly admits to having the entire family cajole her before she left for her exams. Films and dance apart, she'd like to marry "a nice, handsome man, who's simple at heart and someone who inspires and appreciates my interest in the arts".